Since its introduction, the Klon has gone on to define the ‘transparent overdrive’. Cloned by many, modded by some, the originals remain the gold standard for overdrive. 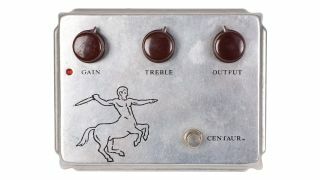 When Bill Finnegan started work on the Klon Centaur, the goal was to create an overdrive that improved on the full, midrange response of the Tube Screamer while adding some of the additional ‘open’ character found in a high-headroom tube amp driven to clipping. The design process, in partnership with two MIT engineers, took from 1990 to 1994, and resulted in a $329 initial price. Despite all the unusual values and out-of-the box ideas in the Klon, the op-amp is surprisingly just a standard TL072. This core design would be produced for 15 years, with minor tweaks and cosmetic changes – such as a move from gold to silver enclosures. Perhaps the most significant innovation of the Klon was the widespread popularisation of charge pumps in pedal design. While most pedals, the Klon included, take a 9V input, the Klon internally boosts this to 18V using a MAX1044 IC. This increases the headroom, changes the slew rate of the operational amplifier, and results in more higher-order harmonic content. It’s no surprise these days to open up a hyped boutique overdrive and find a ‘charge pump’ circuit, but at the time it was revolutionary. In 2014, Bill returned with a new version of the circuit, the stylish KTR; essentially the same, but using surface-mount technology for mass production. Tellingly, it also boasted the same mojo germanium diodes, and bears the tongue-in-cheek slogan ‘kindly remember that the ridiculous hype that off ends so many is not of my making’ on the front. More recently, Bill has begun selling the pedal direct in very limited numbers via eBay - the first of the new run sold for $2,000. The gain control serves a dual purpose on the Klon. As well as increasing the output of the op-amp stage, and thus modifying the clipping behaviour of the pedal, it also has effects on the midrange and bass filtering. As two germanium diodes perform a hard-clip after this stage, feed-forward networks and a summing amplifier follow in the circuit to make sure that the clean signal is preserved, radically changing the character of the pedal and giving it its ‘transparent’ feel. The treble control is an active high-pass filter, which boosts or cuts frequencies above 400Hz. The counterpart to this is that the clean blend path of the dual-gang gain pot forms a low-pass filter at around 500Hz, substantially pronouncing the mid-hump of the Centaur. A simple shunt-to-ground, the output control allows you to attenuate the output signal from the pedal. At more extreme settings, the Klon can deliver a lot of output from its amplification stages and needs taming. While comparing settings side-by-side on the Klon and Soul Food will result in a big sonic difference, it’s possible to get them in the same ballpark. The Soul Food uses silicon diodes, which result in a different character to the clipping, and the Klon has more apparent gain on tap. A bit thinner overall, but into a good amp it’s hard to fault. Perhaps the premier boutique ‘Klone’, as Klon clones are called, the Tumnus was for many years your best avenue to getting the Klon sound on a reasonable budget. There’s a lot of debate as to whether this or the J Rockett Archer is the more faithful reproduction, but there’s no denying that the harmonically rich, highheadroom Tumnus has a bit of magic to it. Like the KTR, which had a selector switch to put the circuit into true-bypass mode, the Sugar Drive lets you choose whether to leave the buffer in circuit when the pedal is off. Other than that, it’s a fantastic, open-sounding overdrive that perfectly sways into the characteristic metallic clip of the Klon at higher gain settings. For a mid-level drive without overly-pronounced treble try out these settings that were based on those that we spotted on Joe’s own gold Klon Centaur. And he now owns a silver version as well, so obviously there was something about this thick Gain tone that really appealed to the blues-rock maestro. The Klon is famously not true bypass. When the distortion circuit is disengaged, the guitar signal still goes through a buffer and has some bass frequencies attenuated. Such is the hype around the pedal that the buff er alone is available from some manufacturers. Why not try it for yourself by buying a Klon and leaving it off? Pearl Jam’s Mike McCready is a Klon user, so for a modern overdrive sound with a nod back to classic rock bands, try these settings. Adjust the tone and output depending on whether you’re on a Strat or Les Paul-style guitar.